Ball and roller bearings are used widely in instruments and machines in order to minimise friction and power loss. While the concept of the ball bearing dates back at least to Leonardo da Vinci, their design and manufacture has become remarkably sophisticated. This technology was brought to its present state of perfection only after a long period of research and development. The benefits of such specialized research can be obtained when it is possible to use a standardised bearing of the proper size and type. However, such bearings cannot be used indiscriminately without a careful study of the loads and operating conditions. In addition, the bearing must be provided with adequate mounting, lubrication and sealing. Design engineers have usually two possible sources for obtaining information which they can use to select a bearing for their particular application: a) Textbooks b) Manufacturers’ catalogues Textbooks are excellent sources; however, they tend to be overly detailed and aimed at the student of the subject matter rather than the practicing designer. They, in most cases, contain information on how to design rather than how to select a bearing for a particular application. Manufacturers’ catalogues, in turn, are also excellent and contain a wealth of information which relates to the products of the particular manufacturer. These catalogues, however, fail to provide alternatives – which may divert the designer’s interest to products not manufactured by them. This article, however, provides the broadest selection of many types of bearings made by different manufacturers. For this reason, we are interested in providing a condensed overview of bearings in an objective manner, using data obtained from texts, handbooks and manufacturers’ literature. 1.2 Construction and Types of Ball Bearings A ball bearing usually consists of four parts: an inner ring, an outer ring, the balls and the cage or separator. To increase the contact area and permit larger loads to be carried, the balls run in curvilinear grooves in the rings. The radius of the groove is slightly larger than the radius of the ball, and a very slight amount of radial play must be provided. The bearing is thus permitted to adjust itself to small amounts of angular misalignment between the assembled shaft and mounting The separator keeps the balls evenly spaced and prevents them from touching each other on the sides where their relative velocities are the greatest. Ball bearings are made in a wide variety of types and sizes. 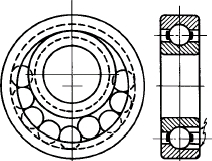 Single-row radial bearings are made in four series, extra light, light, medium, and heavy, for each bore, as illustrated in Fig. 1-3(a), (b), and (c). The heavy series of bearings is designated by 400. Most, but not all, manufacturers use a numbering system so devised that if the last two digits are multiplied by 5, the result will be the bore in millimeters. The digit in the third place from the right indicates the series number. Thus, bearing 307 signifies a medium-series bearing of 35-mm bore. For additional digits, which may be present in the catalogue number of a bearing, refer to manufacturer’s details. Some makers list deep groove bearings and bearings with two rows of balls. For bearing designations of Quality Bearings & Components. Radial bearings are divided into two general classes, depending on the method of assembly. These are the Conrad, or non filling-notch type, and the maximum, or filling-notch type. In the Conrad bearing, the balls are placed between the rings as shown in Fig. 1-4(a). Then they are evenly spaced and the separator is riveted in place. In the maximum-type bearing, the balls are inserted.